The National Institutes of Health (NIH) has spent more than $2 million to promote how joining a community choir can be beneficial to older adults. 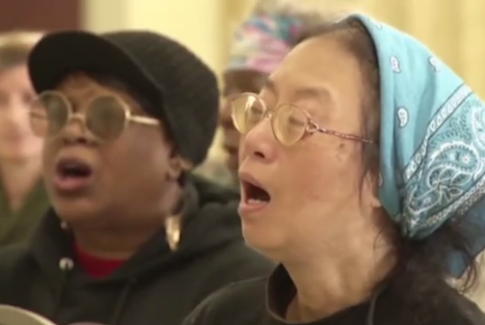 The government is currently financing a five-year project that is recruiting 450 "minority elders" to participate in choirs at senior centers in San Francisco. The premise of the study, entitled, "Community Choirs to Promote Healthy Aging and Independence of Older Adults," is that the country is facing a demographic crisis and needs to prepare for a larger elderly population. "The United States is experiencing a rapid increase in the number of older adults. In 2009, there were 39.6 million individuals over age 65, and this number is expected to almost double by 2030," the NIH grant states. "During the same time period, there will be an increase in the number of older adults with diverse racial/ethnic and socioeconomic status (SES) backgrounds who are at increased risk for poor health outcomes relative to non-minority elders." "Thus, there is an immediate need to identify cost-effective, widely applicable, and sustainable programs that promote health and well-being of older adults," it said. The choir outreach will be tested among "culturally diverse older adults," according to the grant. The NIH’s Institute on Aging is financing the study, which began in 2012. So far, the project has cost taxpayers $2,075,611. The study was most recently awarded a $678,493 grant in August. The NIH has only published one research paper from the study, which examined old people in Finland. "One hundred seventeen older adults who sing in community choirs in Jyväskylä, Finland, completed self-report measures of [quality of life] QOL, depressive symptoms, and a questionnaire about the benefits of singing in choir," the report said. "Results suggest that singing in a community choir as an older adult may positively influence several aspects of QOL," it said. The results were based on Dr. Julene Johnson’s trip to Finland as a Fulbright scholar in 2010. Johnson is a cognitive neuroscientist at the University of California, San Francisco and is now leading the NIH study. Johnson is working with senior centers run by the Department of Aging and Adult Services in San Francisco to create 12 choirs in English and Spanish for the current study. The project is slated to receive federal funding until August 2017. One of the study’s volunteer choirs were seen singing "This Little Light of Mine," during an Associated Press report on the research last year. "Older adults who sing in a choir actually fall less and could potentially have stronger body strength," Johnson told the AP at the time.